When Karamo Brown first auditioned for Netflix’s “Queer Eye,” he knew he wouldn’t win the role of culture expert by discussing art and theater. Instead he decided to redefine what “culture” could mean for the show as how people feel about themselves and others, how they relate to the world, and how shared labels and experiences affect daily lives. 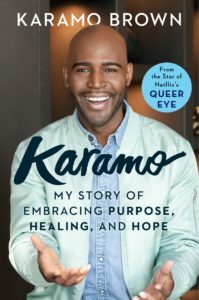 In Karamo: My Story of Embracing Purpose, Healing, and Hope he shares his story for the first time, exploring how the challenges in his own life have allowed him to transform the lives of those in need. Trained as a social worker and psychotherapist, Karamo overcame colorism, physical and emotional abuse, and alcohol and drug addiction. By exploring difficulties, Karamo feels that the makeovers on “Queer Eye” can attain their full, lasting meaning. Styling your hair and getting new clothes is important, but figuring out why you haven’t done so in twenty years can truly change your life. Reflecting on the lessons he has learned along the way, the gay, single father of two shares his story to help others adjust their mindsets, heal emotionally, and move forward to live their best lives. In conversation with Sam Sanders, a reporter and host of It’s Been a Minute with Sam Sanders at NPR.